Tag Helpers provide us with means to change and enhance existing HTML elements in our views. Therefore, we add them to our views, and afterwards, they are processed by the Razor Templating engine which in return creates an HTML and serves it to the browser. Few Tag Helpers actually act as elements or actual tags (environment, cache, etc.). They make working with HTML while using the power of Razor and C# so simple and HTML friendly. Since using Tag Helpers feels so natural and looks like regular HTML front-end people can also quickly jump in and change things without learning about C#. Also, they get to have nice IntelliSense support within the scope of existing elements. Visual Studio automatically colours the img element because we used Tag Helper inside of it. Why the name Tag Helper? Well, we refer to HTML elements as tags (<div>, <body>, <span>) and we want to improve and possibly change the behaviour of these HTML elements. They might remind you of HTML Helpers in Razor. Indeed, they share some of the features. However, Tag Helpers are much more natural to use. We will most usually use them to extend existing HTML elements. We can also use HTML Helpers to create HTML elements from scratch. Another thing they remind me of is AngularJS directives. In AngularJS 1 (before components came to AngularJS 1.5) two most common types of directives were an element and attributed directives. Element directives would create a new DOM element and attribute directives would change the behaviour of existing DOM element. The main difference, of course, is that Tag Helpers will be processed on the server and AngularJS works in the browser. We can use built-in, or custom made TagHelpers as part of existing HTML elements. That’s usually in a role of an attribute. More about image tag helper later in the post! On the image, we can see a custom ‘super-cool-element’ tag helper as custom HTML tag. We can also see a built-in Tag Helper environment. It is quite useful for purposes of rendering content based on current environment. It is important to know that all built-in Tag Helpers are prefixed with asp- prefix. In this post, we will see some of the Tag Helpers in action. To be precise, Tag Helpers from Others category. However, in the next few posts expect to see most important Form Tag Helpers covered. Also, we will cover most important details about caching Tag Helpers. This Tag Helper makes sure that the picture that will display is the latest image from our file system. The code above indicates that every time we change the actual picture on the server (~/images/aspnetcore.png) the image tag helper will append a different string to it and the new image will not be cached so users can see a new image every time the picture is changed. However, if the picture is not changed on the server, we will still be getting a cached version of the image. If I refresh the page, I will get the same content and same version suffix as well. Everything is the same, except the version suffix. The famous a or anchor tag can be extended with various tag helpers. Two tag helpers that you will probably use will be asp-controller and asp-action. These will help us to create links to a specific Action method quickly. If you are familiar with MVC, you probably used @Html.ActionLink helpers to achieve the same result for the anchor tag. In this particular example, the old way might seem shorter and easier. However, the new way is much more natural since we are extending existing HTML tags with ‘custom attributes’ or TagHelpers. Furthermore, it is more clear, since we can easily see which part is the action and which one is the controller. These two make adding JS and CSS references to our HTML much easier. They also enable us to provide a local fallback to URL if we are using an external resource like a CDN. Furthermore, they greatly simplify referencing of a vast number of files using globbing patterns. Just like image Tag Helper, Script and Link Tag Helpers can help us with caching of local files. This example shows that we are referencing Bootstrap’s JS file from aspnetcdn. If that site is not available the local file will be referenced instead. Hence, the asp-fallback-src Tag Helper. What about asp-fallback-test ? Well, that is a way of knowing if we will use fallback source or not. In this case, we use a specific code that is used to check if Bootstrap’s JS functionality is present. If expression inside of asp-fallback-test returns false(falsy) then source from asp-fallback-src will be used. Referencing multiple files is one of the features that I like the most about TagHelpers. It saves me time to reference all or multiple files from a particular folder and its children sub folders. Sweet! I don’t have to reference files, one by one manually. I can use glob patterns and reference multiple folders and also exclude some of them as well. 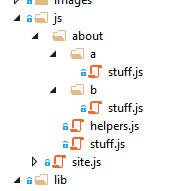 I got all js files from about folder with the exclusion of a folder. With only one script tag we manage to generate so much HTML. Say goodbye to gulp, grunt or whatever you used to reference your JS files from HTML! All this makes me happy because that is yet another thing I’m not going to miss when not developing Angular / React applications in favour of developing with ASP.NET Core MVC. This code will check for class, property and value. If any of those are not found then the local Bootstrap file will be used. 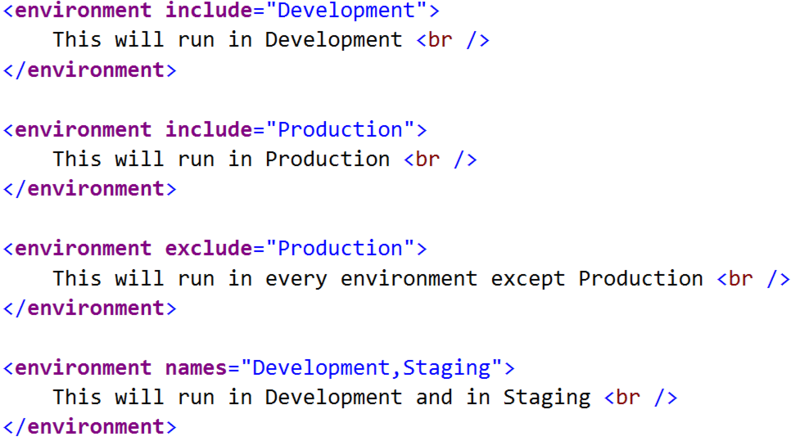 Environment Tag Helper will render the content which it wraps based on the environment that application is running in.